CITR-FM branded by CiTR (lowercase i)is a University Radio of Canada providing services in Metro Vancouver, British Columbia. During 1937, a student group was begun which became a not-for-profit community and started an FM radio in 1982. Student Radio Society of the University of British Columbia controls the radio station and provides the broadcasting training to the students and the members. CITR-FM focuses much on the community and is broadcasting more than 100 programs in seven different languages. In 1983, CiTR started publishing a Magazine known as Discorder Magazine, which is distributed free among the people of the City. Approximately 8,000 copies are distributed per year. The station’s mission is to provide the community access to media and strengthen the students of UBC by training them and providing them a facility of participation in media. 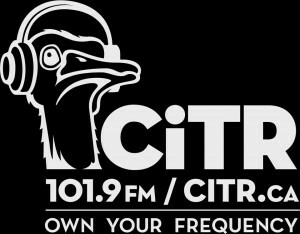 Listen CiTR 101.9 FM live from Vancouver, British Columbia. Hold on for a second as the player catches the stream for you. You can listen SHiNDiG, an annual Battle of the Bands, annually from September to December live on CITR-FM on 101.9 MHz. One of the popular and longest running LGBTQ+ Radio shows in Canada “Queer FM” hosted by Jazmine Khan and DJ Denise is regularly featured on the station presenting the views, concerns and ideas of the community. Fans can also have the access to the podcast as they can also listen CITR-FM live online Streaming at its official site. So browse to the site to listen now, check out what is on air, the weekly schedule and the shows that are broadcasted on the FM station. A visitor can also see the recently aired shows. The website also provides you access to the shows by selecting your favorite genre. You can choose from electronic, experimental, jazz, classical, international, Hip Hop, R&B, Rock, Pop and other. The Slogan of the channel is Vancouver’s Thunderbird Radio. The sports department of CiTR is responsible for providing listeners the live coverage of the games including, ice hockey, football, volleyball and basketball. Whereas the news department collects and on air the local community news, provincial and the international news.